A geofence is a virtual perimeter of interest that can be set up to fire notifications when it is entered or exited, or both. For example, a geofencing app can alert us that our kid has left a previously specified area, or send us a coupon (e.g. the "Present this SMS an get 20% off" offer type) when we happen to walk or drive in the proximity of a movie theater. Download (again via SDK Manager) the Support Library to cater to older Android versions. 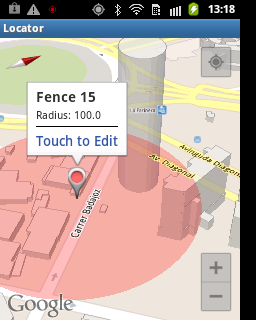 For practical purposes, let's just start where the sample geofencing app (GeofenceDetection) stops, and introduce a few enhancements to make the app semi-decent and show a sample of possibilities with the new Location API. 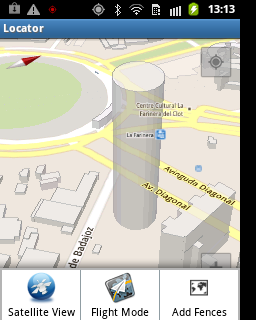 The code above has a zoom level allowing the viewing of buildings in 3D. 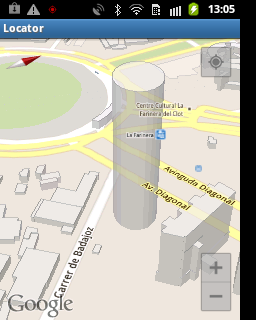 Google Maps v2 uses OpenGL for Embedded Systems (OpenGL ES v2) to render 2D and 3D computer graphics. Even if we are not big fans of an Options menu, it might be adequate in this case, since we would not want to clutter the map with too much "touch" functionality (we will have plenty of that shortly). The sample is here to demonstrate features and makes heavy use of latitude/longitude coordinates. 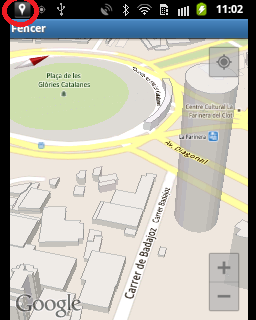 But we need to provide a more user-friendly way to interface with locations on the map, like a street address. We can use geocoding/reverse geocoding to transform a street address to coordinates and vice-versa using Android's Geocoder. OK, now on to geofences. Thanks to geocoding, we can request an actual physical address from the user instead of coordinates. We will just change that address to a latitude/longitude pair internally to process user input. Notice how we use transparent UIs as much as possible to enhance what some might call the user experience. Notice also that we provide a spinner so that the user can choose between predefined values. 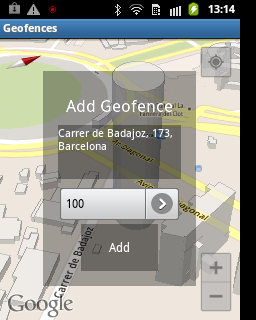 That saves the user some typing and it saves us from validating coordinates values each time. A connection to Google's Location Services is requested by our app. Once/if the connection is available, the request to add/remove a fence is done using a PendingIntent. If a similar request made by our app is still underway, the operation fails. Although the method we call (e.g. addGeofences()) returns at once, we won't know if the request was successful until Location Services calls back into our app (e.g. OnAddGeofencesResultListener's onAddGeofencesResult() ) with a success status code. Finally, the preceding method will use a Broadcast Intent to notify other components of our app of success/failure. 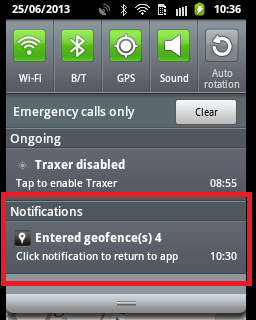 The sample app has all we need to fire notifications once the circled area above is entered or exited. 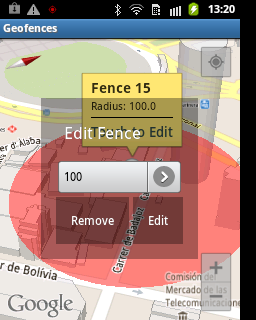 Notice how we set up the marker's Info window to allow editing the geofence radius, or removing the geofence altogether. To implement a clickable custom Info window, all we need is to create our own InfoWindowAdapter and OnInfoWindowClickListener. We can of course change a notification's appearance and functionality, and... that would be the subject of another article. Hopefully, this one gave a glimpse of what is possible with the new Location API. Have fun with Android geofences.